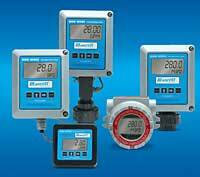 Blancett's model B2800 flow monitor provides users with dependable flow measurement data. Compensation for temperature and pressure is automatically performed, eliminating the need to perform complex conversions. Its microprocessor-based electronics feature more than 50 combinations for flow rates, which can be displayed in 13 different measurement units. Available mounting configurations include a NEMA 4X enclosure in a meter, remote, swivel, and panel mount, as well as a hand-held and explosion-proof mount. The meters operate using a standard alkaline D-size battery, with loop-powered versions also available. Because it can also measure gases, the B2800 can be used with gas turbine meters as well.